That was about all I could think one evening about a year ago, as I sat at a banquet table in the Baker Center at my old school, Ohio University, enjoying a plate full of perfectly done prime rib and the best crab cakes this side of Baltimore. I had been invited back to Athens by the Baker Peace Conference, which was holding its annual seminar last year on the subject of "Populism, The Press and The Election.” I was there to participate in a panel on how the regional press covered the 2016 presidential election. I was seated with some very important and very interesting people – my old friend and competitor, columnist Thomas Suddes, now an OU professor; Bob Stewart, director of the Scripps School of Journalism; Ingo Trauschweizer of OU's Contemporary History Institute, along with a few university trustees. And all I could think of as we enjoyed this incredible meal was how, as a lowly freshman in the 1971-1972 school year, I would amble over from my East Green dorm, Washington Hall, to the Jefferson Dining Hall with a spring in my step on Wednesdays. That was Spaghetti Day, by far the best thing on an incredibly thin weekly student menu. 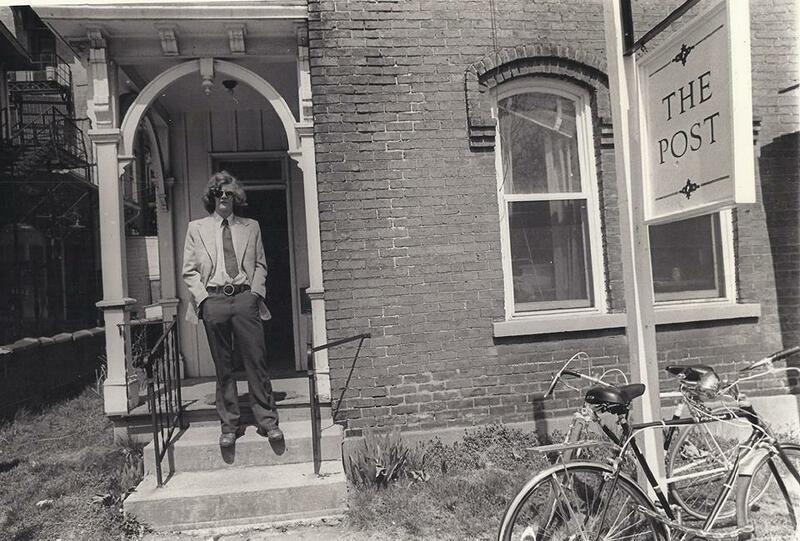 The other thing that occurred to me was that no one from our host – Ohio University President M. Duane Nellis – on down knew my dirty little secret: that 43 years before, there were university trustees who believed that I, a lowly editorial writer for The Post, the student newspaper, had the power to bring down the university. I was the associate editor of The Post at the time, which meant I ran the editorial page and wrote most of the editorials and many a signed column. We "Posties," as we still call ourselves – in solidarity with our brothers and sisters doing good journalism on campus today – pretty much despised the governor of Ohio, James A. Rhodes. Ohio Gov. James A. Rhodes poses in his office in Columbus, Ohio in 1981. 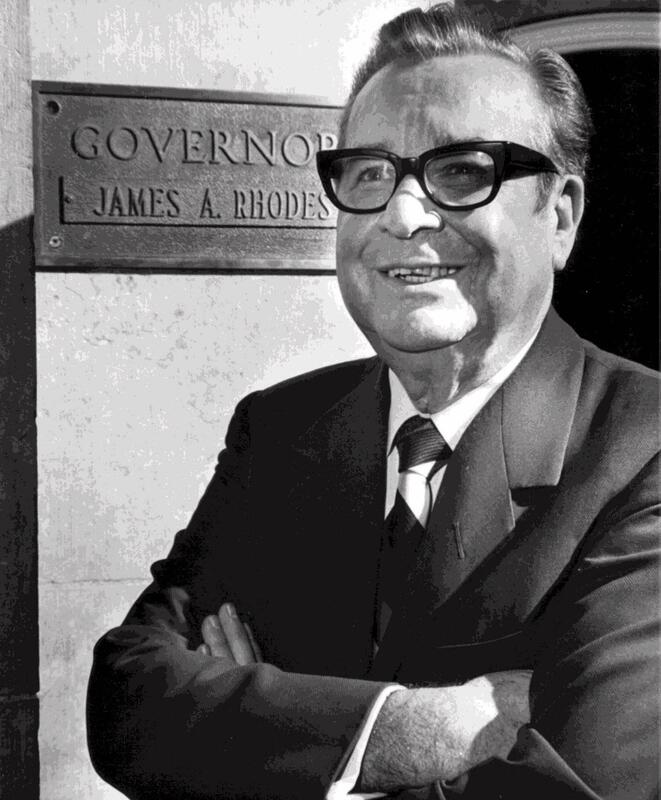 Rhodes had been governor in the 1960s, was term-limited out and made a fruitless run for the Republican U.S. Senate nomination in 1970. In 1974, though, Rhodes came back against the incumbent Democratic governor, Cincinnati's John J. Gilligan, and defeated Gilligan by the slimmest of margins. So, in January 1975, the old rogue was back in office. And, yes, we still despised him. The shootings at Kent State in May 1970 – when he called out the National Guard while he was in the middle of a GOP Senate primary – cost four young lives. That, in and of itself, was reason enough. Then, there was his record of setting Ohio University on a path that would lead to near bankruptcy. In the 1960s, Rhodes worked hand-in-hand with University President Vernon Alden to double the enrollment at the Athens campus and triple the number of students at the five branch campuses. That meant the university went on an unprecedented building spree to handle all the new students. The size of the Athens campus increased by about 750 acres. A new housing area, the South Green, was developed; while the West Green was completed with new dorms. A new regional airport was built. Most of this was done with bond money and, of course, some day, bonds come due. That would not have been a problem had it not been for the anti-war riots that broke out on campus from 1968 to 1970. In the spring of 1970, Ohio University students rioted in the streets. What happened in Kent could easily have happened in Athens. Eleven days after the Kent State shootings, OU president Claude Sowle shut down the campus and sent the students home. All of this caused a precipitous drop in enrollment. I believe there was a sentiment among many Ohioans that they weren't going to send their kids to a place where there were regular riots in the streets. Enrollment at Ohio University plummeted from 19,314 in the 1970-71 school year to 12,814 by the 1975-1976 school year. Less students meant less dollars. Less dollars meant more debt. The university trustees implored the governor and the Ohio General Assembly to come up with a budget that bailed Ohio University out of the debt caused by the 1960s spending spree. It was a tough, hard slog for the trustees. Meanwhile, at The Post, I was merrily churning out editorials and columns making fun of the governor and questioning his leadership abilities. The man, I wrote one time, couldn't organize a two-car funeral. My good pal and reporting partner at The Post, Ken Klein and I, were splitting up the Statehouse reporting duties in those days. One day we heard about an Ohio University Trustees meeting that was to take place the next day at the Athletic Club of Columbus. I told Klein I'd handle this one. I had no car on campus, so, as always, I borrowed the '64 Chevy Impala of our editor, John Kiesewetter. I drove up the next morning, dressed in a cheap suit coat and a psychedelic necktie, thinking that would help me pass any dress code issues in the private club. Howard Wilkinson at Ohio University. This was in the days before the Ohio Sunshine Law existed and there was no requirement that public bodies open their meetings to the press or public. So I knelt down on the floor outside the meeting room, trying to catch snippets of conversation. Suddenly, the door flung open, smacking me on the side and sending me rolling across the thick carpet. It was Jody Galbreath Phillips, who chaired the board of trustees. Oh, I'm sorry, Howard, she said, let me help you up. I liked Jody, who passed away some years ago; she was a genuinely nice person and she truly did love Ohio University. And she was very protective of it. Howard, come sit with me for a few minutes; I need to talk to you. We landed in some nearby wing-backed chairs and she began the most gentle reading of the Riot Act in history. I want you to understand that I can't tell you what to write in The Post; that's your business. But I can tell you that when you treat the governor like that, he is furious and it is not doing us any good. I told her that I couldn't let that influence me; we were writing about a newsmaker and we had every right to be critical of him. I said I had no desire to harm the university, but I couldn't promise that I would stop. Let me tell you a story, she said. Recently, Jody said, there had been a member of the board of trustees in the governor's office, doing some lobbying for an OU bailout. He was an old friend of Rhodes, she said. Except she didn't say "so-and-so." Now, again, Howard, I can not tell you what to do. I just want you to think about it. I'm sure you will do the right thing. I sweated over it for a few days, but in the end, I couldn't change my ways. Fortunately, within a couple of weeks, the legislature struck a bargain and got the university off the hook, at least for the short run. What you write can have a big impact. You need to think before you start banging that keyboard.